So how can you discern affordability early on? What if you could have instant and accurate visibility to a consumer’s financial standing, income and employment information before you work the deal? Instant income and employment verification helps dealers gain a more accurate understanding of a customer’s financial standing, providing information such as employer name, employment status, job title, tenure and an annualized income calculation. The Work Number, which includes payroll records from more than 6,600 employers nationwide, including more than 75% of the Fortune 500 and the majority of federal government civilian employers, is a leader in verification solutions in the auto industry. 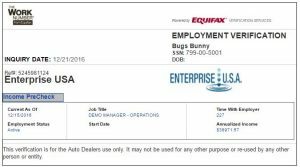 In addition to confirming basic income and employment information, dealers can use verifications to view job tenure, which provides additional insight into repayment risk beyond what a credit score alone reveals. Equifax research shows that consumers whose job tenure is one year or less are almost twice as likely to go delinquent on an auto loan than consumers who have a job tenure of 10 or more years. If you are ready to offer a better auto buying experience that helps you put the right customer in the right car, right away with the right payments they can afford, then Income PreCheck powered by Equifax is for you.